For my grandmother in east Tennessee, keeping her food waste out of a landfill is easy. She collects whatever watermelon rinds, apple peelings and bell pepper tops we’ve generated in the course of a day in a bowl, walks across her backyard, and dumps it all across a red wooden fence into a pasture. The cows on the other side of the fence eat whatever they like, and the rest rots in peace. But I don’t live out in the country like she does. I live in Brooklyn. I don’t have even a tiny backyard to my fourth floor walk-up, much less a capacious cow pasture to toss my food waste into. So the easy thing I do with my food scraps is throw them in the trash. That’s a problem I want to solve. It’s a problem because we in the United States generated 37.06 million tons of food waste in 2013, according to an EPA report. Food waste accounted for about 14 percent of the 254 million tons of total waste generated before recycling. In New York City, nearly one third of the waste collected is organic, including food scraps and yard trimmings that could be composted instead. Diverting organic waste from landfills doesn’t just leave more space for what we really need to throw out, it also reduces greenhouse gas emissions. When organic material like food waste decomposes in a landfill, the carbon in the molecules that make up the food turn into carbon dioxide and methane. Methane from landfills contributed 18.2 percent of America’s human-related emissions of the greenhouse gas in 2014, the EPA says. As greenhouse gases go, methane is even better at trapping heat in the earth’s atmosphere than carbon dioxide, though it doesn’t stick around as long. When organic waste is composted instead of dumped in a landfill, its carbon doesn’t turn into methane. 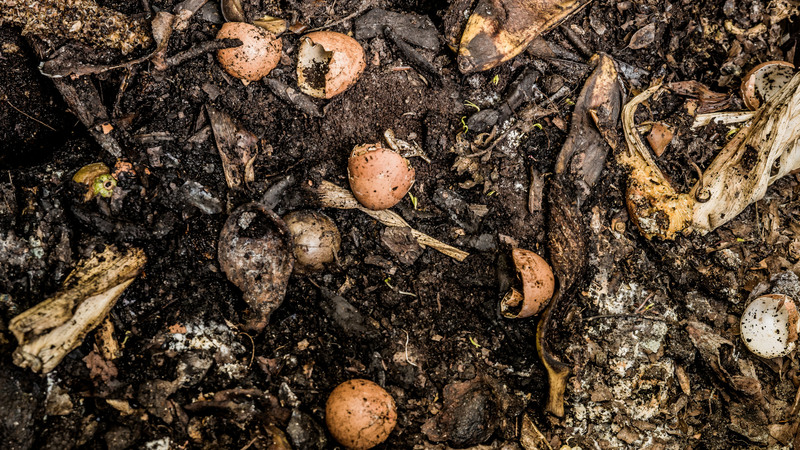 Decomposition without oxygen is what produces methane, but proper composting keeps oxygen circulating through the pile of waste so only carbon dioxide is produced. Instead of emitting methane, composting returns carbon to the soil, so much that the net emissions are actually negative. The EPA estimates that the 5 percent of American food waste that was composted through community programs in 2013 reduced our greenhouse gas emissions by 1.7 million metric tons of carbon dioxide, the equivalent of taking 308 thousand cars off the road. With a little effort, we can do better than that 5 percent. Composting correctly does take effort, especially for those with backyards but no cow pasture. Food waste must be layered with leaves and yard clippings, and must be turned over regularly for oxygen to reach all layers of the pile. For those of us who live in yard-less apartments, the City of New York sells an under-sink composting kit of a special bin and a pound of red worms for $55. If I got one, I’d still have to figure out what to do with the compost my pet worms produced. Maybe I’d get some more house plants. But my roommate put her foot down on the worms anyway. New York City also runs a food waste drop-off program. I made a good faith effort to participate last spring, storing my week’s worth of banana peels, apple cores and sweet potato peelings in the freezer to keep them from smelling until I could dump them at the collection site next to my subway station on Wednesday mornings. For a few weeks, everything was fine, and I felt a little smug about my new special sustainable-ness. But then I forgot my bag of frozen food scraps one Wednesday morning, and a whole extra week of coffee grounds and sad spinach leaves built up in my freezer. I didn’t want to encroach on my roommate’s side, so I threw away fresh organic waste that wouldn’t fit. Then my commute changed and I walked to a different train station, one with no food scraps drop-off. In the end, I ditched the composting attempt out of, let’s face it, laziness. Until it’s as easy to compost as it is to just throw away my food scraps (as it’s becoming for some New Yorkers), I probably won’t be doing it, regardless of all the environmental benefits. I’ll have to deal with my grandmother being greener than me.